Product Description (back cover): So you think you're a Disney expert... Sure, you may know the words to every Disney song and the names of all the Seven Dwarfs. But do you know: A. The names of Cinderella's stepsisters? B. Who Mulan's sidekick is? C. What Disney character said, "I do wish I hadn't cried so much"? Never fear! 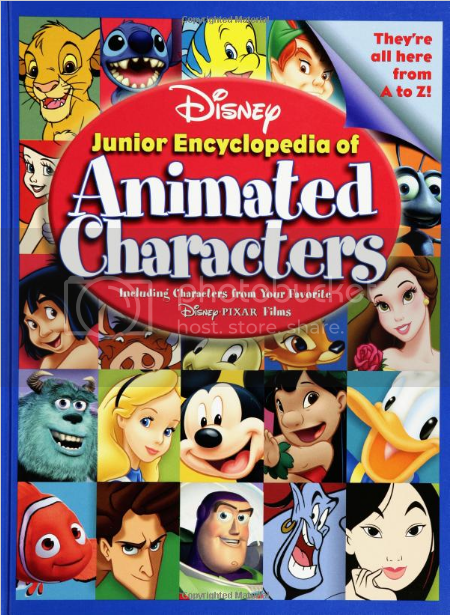 All the answers are here, inside the Disney Junior Encyclopedia of Animated Characters. It's filled with fun facts and cool trivia about the best-loved Disney and Disney/Pixar personalities, plus many of their famous and funny quotes. So look up your favorites and get the inside scoop. Impress your friends and annoy your family! With this entertaining book, you'll learn everything there is to know about your favorite animated stars. Where can it be purchased: The book can be found online at Amazon.com (Hardcover version). Copyright © 2004 by Disney Enterprises Inc.